to be noted that the bolt with Allen head are toot short and the thread is not screwing in. Seems to me they are just there to close the holes somehow also seen the red sealant used. What is supposed to be there instead ? According to the part catalogue there are only two studs holding the manifold in place but according to other catalogue online there are three…am lost. Someone before you removed air injection system and plugged the holes with those srews. Quite common thing to do on these engines. That doesn’t look like a good way to plug those holes. Looks like it might keep the items from assembling correctly. Tks Guys. So have to figure out the proper way to plug the holes. John Napoli offers a suggestion for plugging the air injection holes in the intake manifold: “Buy 1/4” nail anchors from Home Depot. They are aluminum and look like a large pop rivet. Get them 1” long. Cut them back to 5/8” long with a band saw or hack saw (only cut the body, don’t worry about the ‘nail’). Put the two o-rings from each air tube on the shank of the anchor. Smear on some engine-grade silicone. 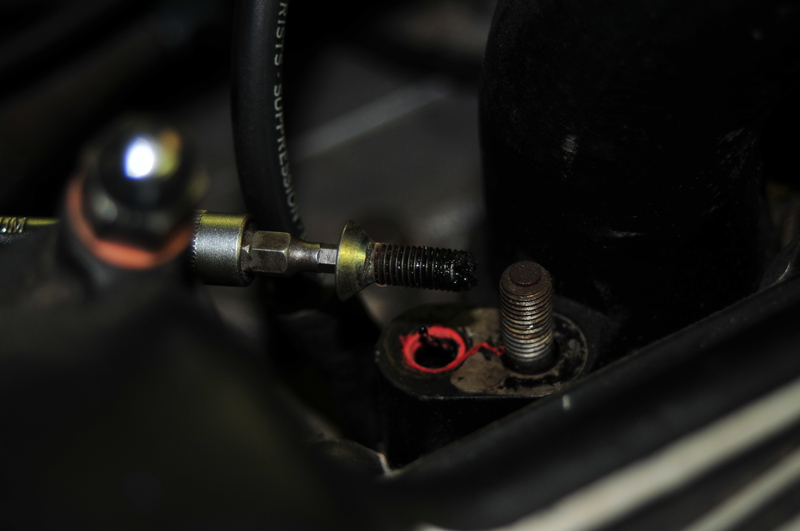 Insert into the manifold and hammer down the nail all the way. Omit the ‘plates’ and retighten the intake manifold to the engine. Looks great and works great.” This mod is likely to require an extra washer or two on each stud, since the studs may not be threaded far enough to tighten the nuts down on the manifold flange with the plates omitted. Michael Aiken’s local Home Depot apparently carries similar anchors in a different package: ““Red Head” light-duty anchors. They are 1/4" x 1" hammer-set anchors used for anchoring to concrete. hammer drive anchors are available at some other hardware stores, usually in the bin right next to the 1” ones. 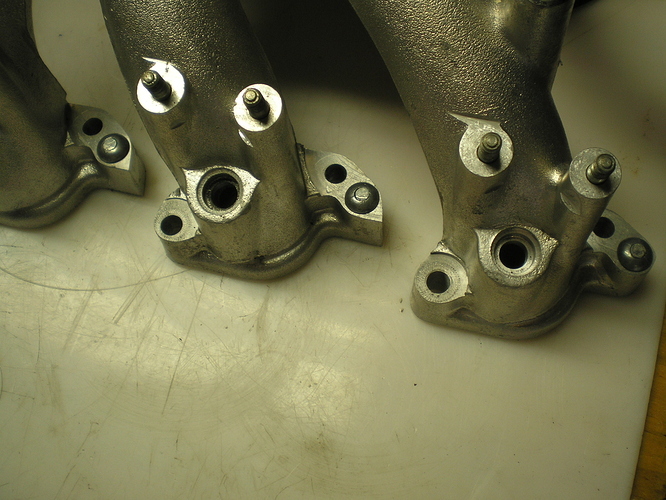 Since the flange on the intake manifold is about 7/8” thick, these anchors can be used without cutting them shorter. 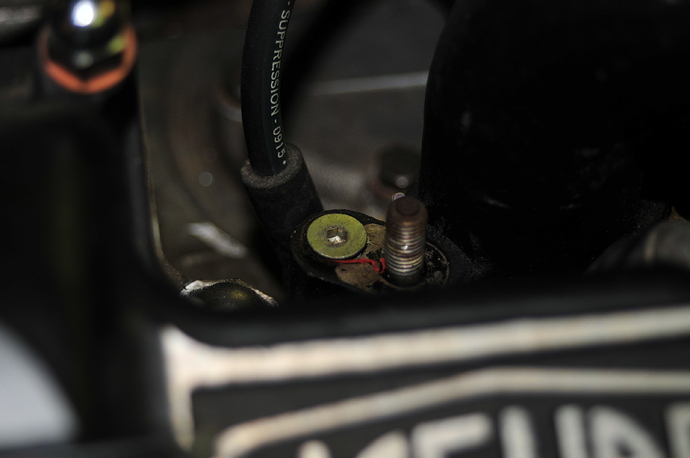 If you set about removing pump, valving, plumbing, and rails with the engine in the car, you will find it very difficult indeed to remove the pipe that goes from right behind the air pump along the bottom right side of the engine and emerges behind the turntable. Some have resorted to ripping this pipe to pieces to get it out. The easiest solution is to simply leave it there. If you ever have the right side exhaust manifolds off for some reason, you can remove it then. This is a picture of the aluminum 1/4 inch anchors mentioned installed. It does indeed. Many tks. Have to find out something similar here in Europe. How about lead shot? Find some slightly larger than hole and tap in place with a punch.